Can computers make art? Working from home just like your humble servant and mastering his craft for over a decade, programmer, composer and movie director Wayne Lytle think they can. As the main creative force behind Animusic LLC, a 3D animation company producing animated music content founded by Lytle in 1995, initially under the name Visual Music, that is exactly what he lets his computers do. Animusic media is formed by a proprietary, custom-written software, branded as Animusic Studio, that generates the animation in a semi-automatic process manipulating the animated fingers, hammers and pluckers of the robots based on the data fed in the corresponding MIDI file. Thus, with both graphics and music synthesized digitally Animusic can in my opinion be considered as a new form digital media, perhaps even a new form of art. 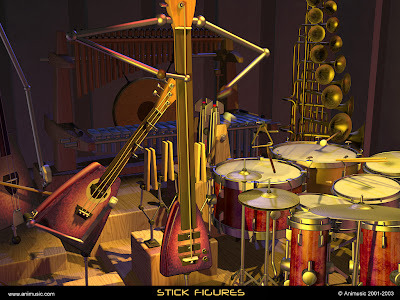 According to Animusic “Virtual instruments are invented by building computer graphics models of objects that would appear to create the sound of the corresponding music synthesizer track. 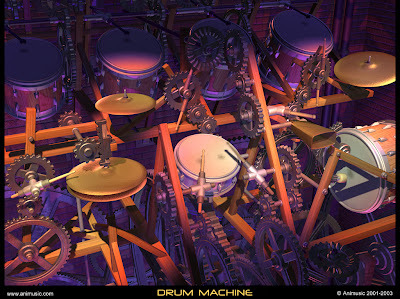 Graphical instruments range from being reminiscent of existing instruments to arbitrarily abstract.” In other words, if the midi data is changed after the movie was created a new version of the movie including the changes is generated automatically by the software. If you refer to the outcome movie – rather than the input music – as the final creation it means this form of art is generated by a computer software. not by a human. A few free Animusic clips, screen savers, desktop wallpapers and mp3 files are available for download from the company’s official website. More than two dozen clips are also available on YouTube. The company’s store offers DVD and CDs, along with a cool Animusic T-shirt. 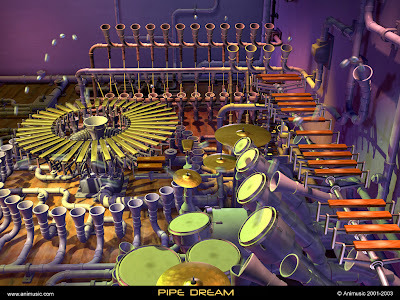 Thanks to Koyotie for sharing with me the Pipe Dream Animusic clip. They play lots of Animusic clips on our local public broadcasting station — even if I’m just channel-surfing I can’t help but stop and watch. This entry was posted on October 7, 2007 at 11:15 pm and filed under animation,art,music,video. You can follow any responses to this entry through the RSS feed. You can leave a response, or trackback from your own site.